Give the gift of creating! 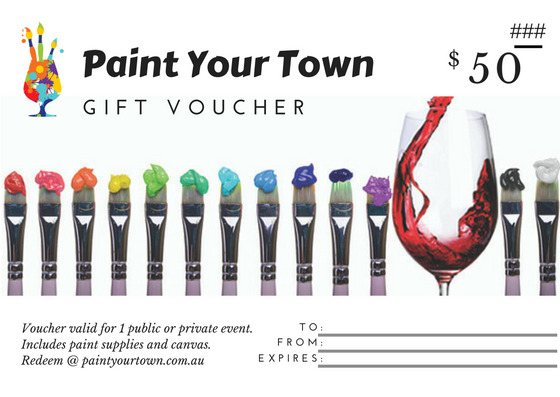 Paint Your Town gift vouchers are a fabulous way to show you care. Please specify if you want us to post or email you the printable voucher. This voucher is valid for one public or *private event of your choice (valued at $50 and includes gst). To redeem for a public event: log onto paintyourtown.com.au and select the public event you want to attend. Email info@paintyourtown.com.au stating the event date and location. To redeem for a private event, simply bring your voucher to the party or you can always email us at info@paintyourtown.com.au and state what event you want to attend and your voucher #. Each event includes a 2 hour paint lesson, a canvas, paint and supplies and an apron. No experience necessary. Food and alcohol sold separately. Email us at info@paintyourtown.com.au with any questions. Happy Painting! Paint Your Town is the most fun, creative experience you’ll ever have! An artist coordinator will guide your group in a 2 hour paint class with step-by-step instructions. We have everything you need to have fun and make a memorable keepsake. Get your creative juices flowin' with a favourite cocktail in one hand and a brush in the other at one of our public paint and sip events or host your own private pARTy in your own home, office, or favourite venue. ​ Beginners and all abilities welcomed! Wow. What a AMAZING night. The artist did a wonderful job inspiring us with great guidance to create a special masterpiece. Paint Your Town really is catering to every individual. At the end of the night we all took home a canvas we had designed, even those who said they couldn't draw stick figures were impressed with their own creations. Thoroughly recommend everybody gives this a try!!! You will be surprised at your own artistic flair.